The earliest known metal equestrian bit has been unearthed by archaeologists in Israel. The bit was discovered in an equid burial site at Tel-Haror, and had probably been used on a donkey. Archaeologists led by Professor Eliezer Oren, from Ben Gurion University, made the discovery in a layer of material dating from 1750 BC to 1650 BC, known as the Middle Bronze IIB Period. It is among a growing number of sites in the Near East yielding the remains of horses and donkeys. Dr Joel Klenck, a Harvard University-educated archaeologist and president of the Paleontological Research Corporation, led analysis of the remains in the Tel-Haror site. He said the burial site is at the base of a dome-shaped structure. The southeastern wall of the burial edifice was overlaid by a thick mudbrick partition that surrounded a nearby temple complex. Klenck, an archaeologist specialising in the analysis of animal remains, noted the animal was a donkey, as evidenced by foot bone measurements and traits on the grinding surfaces of its teeth. 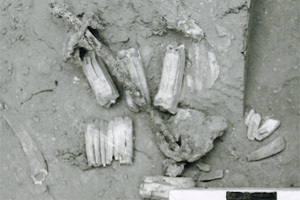 Klenck said the site yielded the earliest direct evidence of a metal equestrian bit. “Until the excavation at Tel Haror, archaeologists had only indirect evidence for the use of bits,” he said. “An example of this indirect evidence is wear marks on equid teeth at the fortress of Buhen in contexts dating to the 20th century BC. Round plates on either end of the ancient bit feature triangular spikes that pressured the lips of the equid if the reins were pulled from one direction. He said the discovery provided important insights into ancient equestrian practices and methods of transportation in Near East. Other discoveries in recent years in the Near East have painted a picture revealing the extensive use of donkeys and horses in ancient cultures. The Vulture Stele, in Mesopotamia, dating to 2600BC to 2350BC, known as the Early Dynastic III period, portrays an equid pulling a chariot-like vehicle. Various Mesopotamian manuscripts dating to this period mention the horse, donkey, hemione and hybrids such as the mule. From Sumeria, terracotta reliefs from the early second millennium BC show equids pulling a chariot and a human riding horseback. Hittite art from the 13th century BC, in modern Turkey, show a larger species of equid, perhaps a horse, pulling a chariot with three soldiers, in contrast to smaller equids in Egyptian murals pulling chariots with only two men. Horse bones were found at Tell el-‘Ajjul, in Israel, in contexts dated to around 3400BC and, in Turkey, at Bogazkoy, from the 17th century BC. Archaeologists excavated donkey remains at Tell Brak in Mesopotamia dating between 2580BC and 2455BC. Egyptian donkey burials dating to 2000 BC to 1550 BC, known as the Middle Bronze II periods, include those found at Inshas, Tell el-Farasha, Tell el-Maskhuta, and Tell el-Dab’a. From similar time periods in the Levant – the area including most of modern Lebanon, Syria, Jordan, Israel and the Palestinian territories – archaeologists have excavated donkeys at Tell el-‘Ajjul and Jericho. Thank you for this interesting article– I see that some of the major online archaeology news sites have picked this up as well. Really Noah. Please if you have any links, can you share with me. I find this an extremely interesting article. Thank you for any references.